We found a Craigslist dresser for Henry's nursery. It did well, but I was ready for something new. My mom and dad had this beauty in their basement, and I took them up on the offer to use it for this baby. It is old but is constructed pretty well. The top had many stains, so I thought I would paint it. 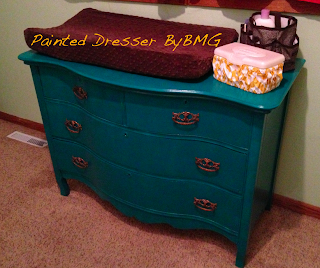 I'd painted a dresser before, so I knew I could do it. 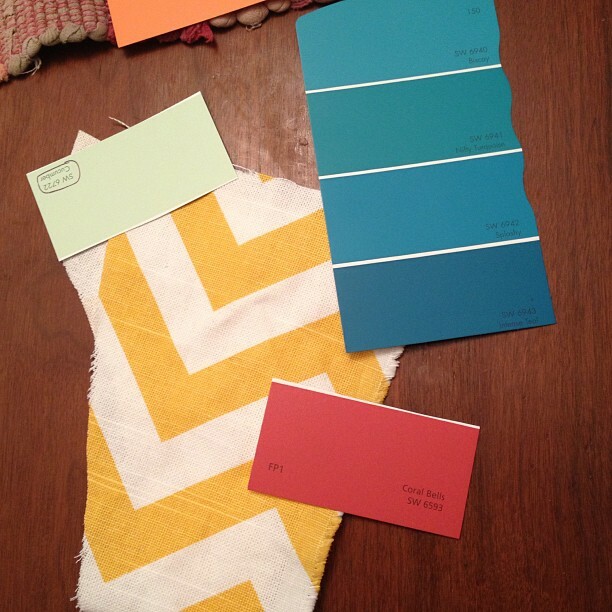 This time I opted for one color instead of the paint chip effect I did with the one in our bedroom. The first task was selecting the color. I went to our local paint store and took the fabric sample I've been using as well as the wall color of the room (light green) with me. I didn't want to put my poor family through repainting the walls again (We painted them for Henry's nursery, and then I just had them paint Henry's big boy room.). I crowd sourced some ideas on Facebook and ended up going with a dark turquoise. I don't mind the original hardware and wanted to keep the project low-budget, so I took off the handles and soaked it in some Dawn dish detergent + vinegar + hot water. It took off some of the grime. I just painted over the locks. I used the same Zinsser primer I used with the other dresser. It had a strange layer of goop on top from sitting for a while, but I skimmed it off, and it seemed to be ok. I painted with a small foam roller and a brush for the tricky areas. One little trick I tried this time to avoid the stick of newspaper was to use some coaster under the legs. It worked like a charm! This is what it looked like after one coat of paint. I ended up doing three coats of paint. With that dark of color, I felt I needed that coverage to get the white of the primer hidden. Next up in the nursery is new window coverings and something new for the walls. I'm not sure what either will be yet, so you'll have to wait and see!